Wahl 5 in 1 Blade Refurbishment - Precision Sharpening Inc.
We now offer complete refurbishment of the Wahl 5 in 1 blade at competitive prices. Because of the way these blades are built they are very difficult to sharpen. 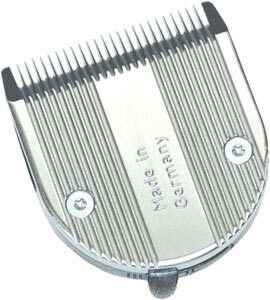 This is because the cutter blade is made of very thin metal and is not designed to be re-sharpened. Refurbishment includes sharpening of the comb blade and replacement of the cutter blade and any other blade parts as needed. Essentially you get a new blade for the price of refurbishment. This is the best way to repair these popular blades with guaranteed results. Call or email for pricing and turn around time. Use the convenient printable order form on the "Price, Payment & Shipping Links" page and ship you blades today.